Bummer when the alarm went off at 5am, I was just getting into a really good sleep after a fair bit of rock and roll, especially when the tide turned! However, it was so worthwhile, because we had the sun rising in the East with a moonset in the west, and a glorious moon path to boot. 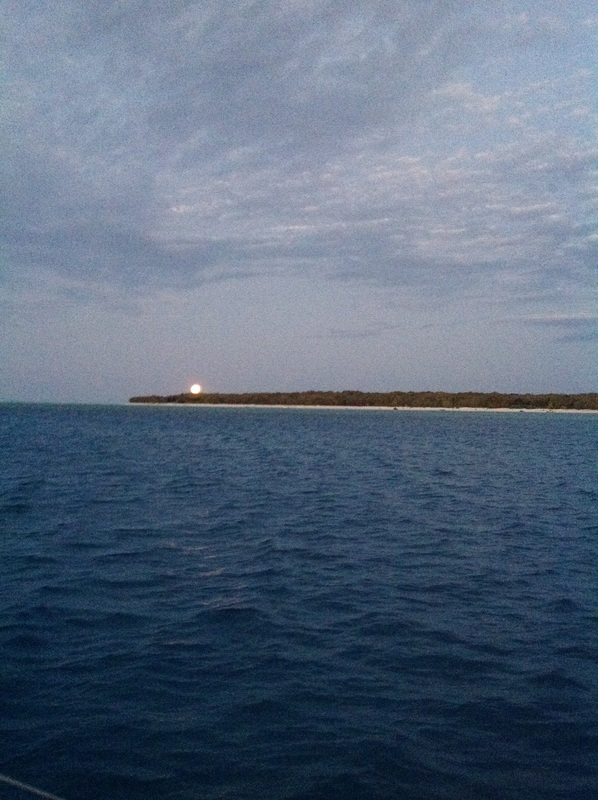 As the sky lightened, the moon got bigger and pinker until finally the moon sunk behind the mainland. 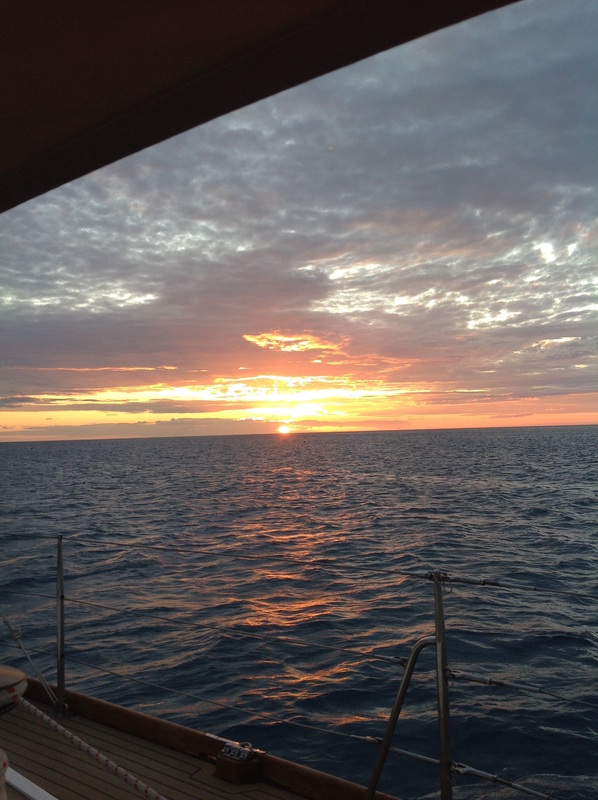 We departed our anchorage at GKI around 5:30 am, and headed out east, towards Barren Island, with an almost cloudless sky and the sun getting warmer by the minute. The forecast is still looking good for the next week, with a south to South East due around Friday evening. This may mean we spend an extra night at Tin Can Bay, but that’s a long way out for forecasting, so we will play by ear, with a base plan and a few alternatives. Around 6am we had coffee and croissants for breakfast, with the “chook pen” driving the boat, and Us Around the cockpit table, soaking up the beautiful early morning. We aimed for landfall at North West island at about lunch time. The weather was warm and sunny on the run across and the wind very light. We saw whales and dolphins and squadrons of flying fish, and the island came into view from about 15 miles out, a low lying green Island. We dropped anchor in about 10 meters of water off the western end of the island in a bow in the coral reef, and we could see the anchor on the bottom the water was so clear. As we were waiting for the anchor to set, we watched a fin circling and wondered if it might be a shark, but the motion was wrong. Watching for longer to check what it was, we realised it was a manta ray, and then saw several between us and the reef. 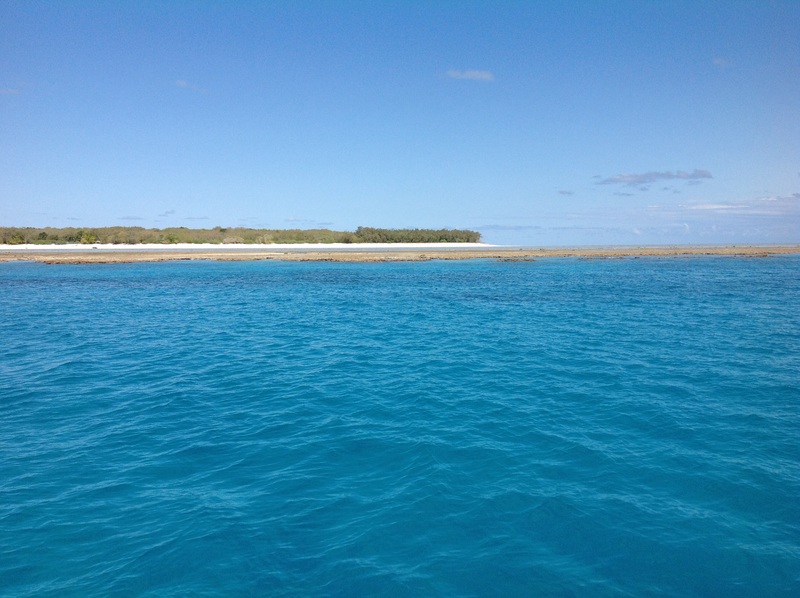 We made lunch and then jumped into budgie for a snorkel, just a short distance from Pilgrim, but beautiful clear water and many fish. Some interesting nooks and crannies in the coral with swim through holes and pools. On the way back to pilgrim we checked out the anchor, and saw a ray, and as we got back on the boat, so Pete spotted a manta close to us, and jumped in to swim with it. Warming up on the decks (boiling in the sun) with a cup of tea, we watched more whales and manta rays as the afternoon breeze filled in slightly. The tide turned and we swung with the breeze instead of the tide and settled back onto the anchor, waiting for sundown time and for the reef to cover back up with the incoming tide. It’s glorious here, such a beautiful place and perfect weather for it so far. 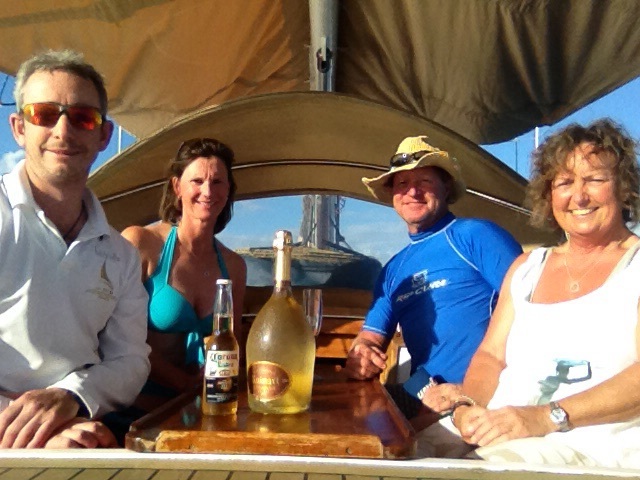 A few clouds came across as storms swept up the coast, but we missed out on rain and instead had a fabulous sunset again as we got into the magnum of Ruinart Blanc de Blancs. We had just drinks for sundowners as we watched the sunset and then started prep of the paella for dinner. Dinner on deck though it was a little cooler, the breeze seeming to come up with another fabulous full moon rise over the edge of the island. The paella was great, very tasty and all eaten, as well as the champagne finished, and we headed off for an early night around 8:30!